Public Policy Polling has a new North Carolina poll out. It's Obama 47, McCain 45 and Bob Barr 2. Full poll results are here. Big Tent Democrat reported on other polls earlier today. Why Did Obama Do Worse in N.C. Than Virginia? Obama won Virginia by 28 points and North Carolina by 14. What's different, given the similar voter demographics? In Virginia, Obama won 45% of White Women , in North Carolina only 33%. In Virginia, Obama won 93% of Black Men and 85% of Black Women. In North Carolina, he won 91% of Black Men and Black Women. CNN calls North Carolina for Obama as soon as the polls closed. I'm still following Indiana, as i think that's the more important state for Hillary Clinton, but I'll post results here. You can keep each other updated in comments. BTD will do a separate thread with new exit poll data from N.C.
A new Insider Advantage poll from North Carolina was released this afternoon. It was taken yesterday and shows Hillary and Barack Obama in a statistical dead heat: Obama 48%, Hillary 45%. Undecided: 7%. Actual poll results are here. InsiderAdvantage’s Matt Towery: “Really interesting dynamics at play here. Clinton has increased her lead among white voters to 58% - very close to the 60% plus level needed to pull off a victory. She now leads among those who say they are Democrats but has started to trail among Unaffiliated voters, who are allowed to participate in Tuesday’s election. Additionally, African-American voters are not quite as solid with Obama as they have been, at least based on previous exit polls. Clinton has remained in the upper teens (17%) of African-American support in our recent surveys. African-American turnout will be the key to this race. Our poll is based on a turnout model of 35% African-American vote. Anything under that number could give Clinton a shocking upset. But Indiana has become a true horserace that should concern the Clinton camp." There is no foreseeable outcome in North Carolina, regardless of which candidate wins the popular vote, where one candidate collects significantly more convention delegates than the other. Therefore, the exact final vote totals have much more symbolic importance than real importance. Congressional Quarterly (CQ Politics) says even if Obama wins North Carolina, he is likely only to gain 3 more delegates than Hillary at the District level. Of North Carolina's 134 delegates to the national convention, 77 are district delegates. Despite Obama's eight-point advantage in recent North Carolina polls, CQ Politics forecasts a gain of only three district-level delegates in tomorrow's primary. The Obamas will also be in North Carolina, campaigning in Durham and Fayetteville. What does it mean that both candidates are spending the day before the NC and IN primaries in NC? There are 72 pledged delegates at stake in Indiana and 115 in North Carolina. Indiana hasn't voted for a Democratic president since Lyndon Johnson in 1964. North Carolina voted for Bush in 2000 and 2004 (by 13% and 12%). Even native son John Edwards on the ticket didn't matter. Since 1964, the Democratic Presidential ticket has carried N.C. only for Carter-Mondale in 1976.. Here are the latest voter stats, as of May 3, for North Carolina. As for Indiana, the New York Times explains it's very complicated. Maybe that's why the polls are so divergent. Update: Comments now closed, new thread is here. Hillary Clinton and Barack Obama spoke tonight at the Jefferson-Jackson Day Dinner in Raleigh, NC. Hillary has already spoken. Obama's speech is playing here right now. More than 5,000 attended the dinner. Insider Advantage Poll: Hillary Takes Lead in N.C.
Update: The new Mason Dixon North Carolina poll has Obama up by 7 with a 5 point margin of error. Where there is no competition is race. Eighty-seven percent of African Americans plan to vote for Obama, while 62 percent of whites said they will vote for Clinton. There has been very little evidence suggesting either candidate can cut into those numbers before Tuesday. The poll found Obama does better on the war in Iraq but Hillary does better on the economy. A new Insider Advantage North Carolina poll of likely Democratic primary voters is out tonight. Hillary Clinton has pulled into the lead over Barack Obama. As reported yesterday, North Carolina Governor Mike Easley today endorsed Hillary Clinton. "It's time for somebody to be in the White House who understands the challenges we face in this country," Easley said, adding a gentle dig at rival Barack Obama's signature slogan of hope. "There's been lots of 'Yes we can, yes we should.' Hillary Clinton is ready to deliver," Easley said. "The governor and I have something in common — we think results matter," Clinton said. Easley ended his remarks saying Hillary "makes Rocky Balboa look like a pansy". Easley is Clinton's second N.C. superdelegate. 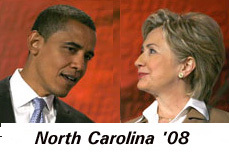 Six other N.C. superdelegates support Obama.